I am always excited when I am offered the opportunity to read a book that delves into the world of art. 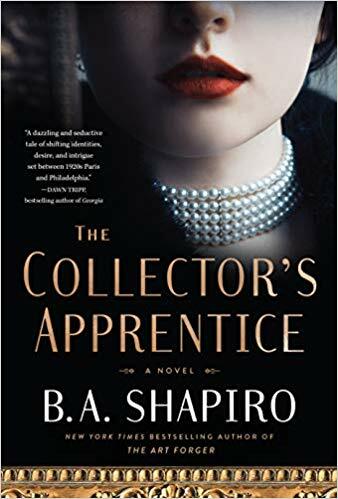 I was very happy to accept a free copy of The Collector’s Apprentice by B.A. Shapiro from the publisher for my honest review. I am the author of THE COLLECTOR’S APPRENTICE as well the bestselling novels The MURALIST and THE ART FORGER, all set in the art world. I am also the author of five previous novels (THE SAFE ROOM, BLIND SPOT, SEE NO EVIL, BLAMELESS and SHATTERED ECHOES), four screenplays (BlindSpot, The Lost Coven, Borderline and Shattered Echoes) and the non-fiction book, THE BIG SQUEEZE. In my previous career incarnations I have directed research projects for a residential substance abuse facility, worked as a systems analyst/statistician, headed the Boston office of a software development firm, and served as an adjunct professor teaching sociology at Tufts University and creative writing at Northeastern University. I like being a novelist the best. I began my writing career when I quit my high-pressure job after the birth of my second child. Nervous about what to do next, I said to my mother, “If I’m not playing at being superwoman anymore, I don’t know who I am.” My mother asked, “If you had one year to live, how would you want to spend it?” The answer: write a novel and spend more time with my children. And that’s exactly what I did. Smart mother. My husband Dan and I raised our children in Boston and now divide our time between Boston and Florida. And yes, I’m working on yet another novel but have no plans to raise any more children. You can visit me at www.bashapirobooks.com. Paulien has been severely wronged and she now finds herself alone in Paris with no money, no friends and her family thinking she has stolen their priceless art collection. To make matters worse it was her fiance who perpetrated the con that led to the loss of the art. Paulien is determined to get to the bottom of things so she makes herself over into Vivienne and she sets out to get her family’s art back and extract revenge on her fiance. Fortunately Vivienne is perfectly suited for a job in the art world as she was raised in a world surrounded by great art and he father made sure to educate her about art and artists. When she is offered a job by a wealthy American collector she jumps at the chance and is soon helping him and attending soirees with Gertrude Stein and Henri Matisse. She and Matisse are soon much more than friends. Her life becomes a whirlwind of travel between Europe and Philadelphia helping to set up a new museum with her American, Edwin Bradley. But life is never simple, nor is the course of love. Her ex fiance shows up again, but why? Before she can find out he ends up dead and she is the main suspect. Will she be able to finish her work with Bradley? Will she get out from under the murder charges? And where is her father’s art? Oh, this was a book full of intrigue and mystery. And art – lots of art, whether stolen or not it is the focus of the story. The book is loosely based on real events and I always enjoy a story with a grounding in reality. I found the characters to be interesting and unique. Ms. Shapiro knows how to bring a time period and place alive with her writing. I found myself all wrapped up in the excitement of travel between countries at a time when such travel was far more interesting than it is now. It all came alive as I turned the pages. The ending was not what I was expecting but it was satisfying.